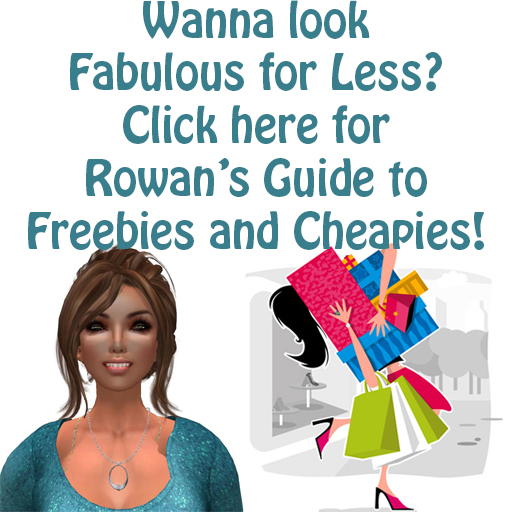 How to look FABULOUS for free! Welcome NCI readers! Today’s post is going to cover a subject near and dear to my heart – Freebies! Everyone knows that one of the biggest parts of Secondlife is the infinite ways we can customize our avatars. Just check out the Marketplace sometime and see all the different outfits, avatars, accessories and parts for sale. “But Rowan,” you say, “I’m on a budget!” Well honey, who isn’t? For the best guide to freebies and cheapies in SL, head to your closest NCI campus and find this notecard in the Freebie Vendors. I’ve scoured the grid for the best quality freebies. Hair, makeup, clothing, avatars, even men’s stuff! Not sure if I’m telling the truth? Check out this outfit I put together in about 20 minutes of hopping around the landmarks in the notecard. See? It’s not hard to be beautiful on a budget. The long awaited new advertising experience is live across all three of the NCI campuses! The new boards are static and can be rented for as little as $50L a week. 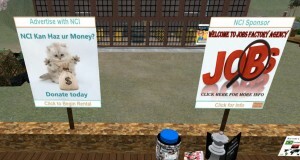 These new ad boards are instantly rentable and don’t need to be set up by an AdNode staff member. Even the first night they were live, we already had some renters! All the boards are placed at highly visible areas in each campus.